To accomodate all involved, Lane ends up having three different celebrations on the same day, which I think is a good solution/compromise for everyone. It actually turns out kinda fun and everything moves along quickly. The first thing was "the grandmother's wedding" -- a Korean Buddhist ceremony which her devout grandmother demands and travels all the way from Korea for. 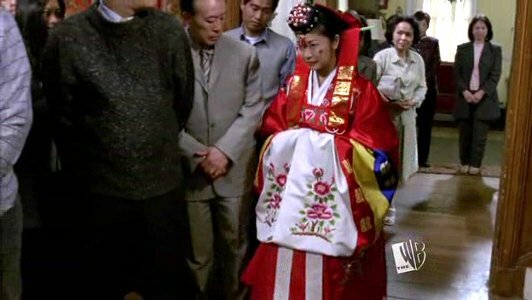 Lane wears a Korean hanbok for this part. I'm not sure if the red circles on the cheeks are part of the tradition or if this is a parody of how some Asians may apply makeup. I also don't know whether or not the tea drinking is really a part of a Korean ceremony, or if it's a Buddhist thing, or something just made up. After the grandmother leaves, everyone heads to the church for the Christian ceremony (the "mother's wedding"). Actually, they run b/c there is a limited number of seats. 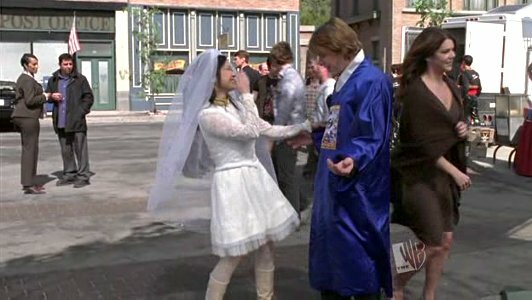 I thought this part was hilarious b/c Mrs. Kim shouts "Go!" 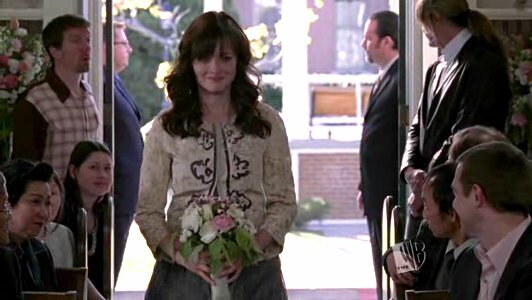 and everyone starts running except for Lorelai and Chris, who are stunned and confused. When they learn what's going on, they're both like "I thought this was the wedding!" 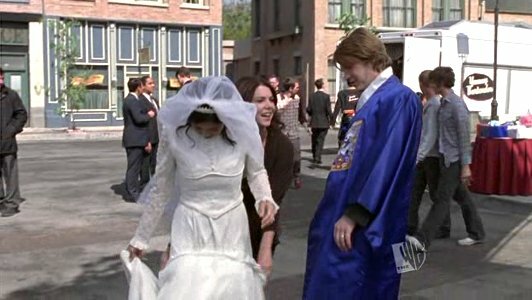 I like Lorelai's dress (especially the 2-color sash) -- I think it could pass as a bridesmaid's dress (too bad brown is not part of my color scheme). I like Lane's makeup. I think I will aim for this look. After the ceremony, there is a quick outdoor reception. It is an assembly line that starts with a buffet, which all the Koreans line up at (Rory tells Lorelai the Korean food is not for her), get their food in takeout boxes, drop their gifts into a bag that Lane holds, say goodbye, and drive off. I think this is how most older Chinese guests would like weddings to be -- eat and run. But at least Mrs. Kim's guests bring a gift... not sure this holds true for the older Chinese guests. After all her family pack up and go on their way, the real party begins. They serve hot dogs and fries for this part. The coolest thing about Lane's dress is that it's totally converted to a knee-length one and the collar opens up to reveal some color (and gasp! skin). 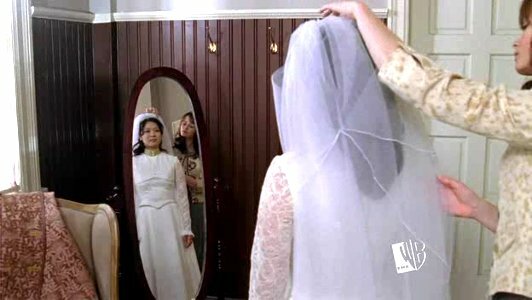 Check out the collar and shorter veil. I like how she lets down her (curled) hair too. Their cake looks interesting (though I don't remember seeing this while watching the show), modeled after the White Stripes album cover, I'm told. I think the theme for this part of the day is sorta "hip rock band," totally fitting for Lane. For entertainment, Lane, Zach, and their band play. 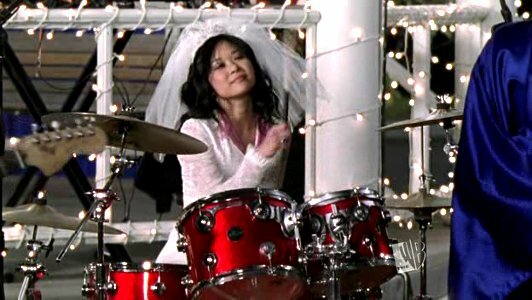 They play a good rendition of "I'm a Believer" and if they were a real band, I'd hire them for my wedding. They are the inspiration for my wedding music search. I think this is the only part of the entire day that Lane planned. Maybe that's the key -- each person who wants something specific done should plan it themselves. Of course, this is all make-believe (there was a very short timeframe from proposal to wedding, there seemed to be hardly any planning on Lane's part, there didn't seem to be invitations b/c ppl didn't know what's going on half the time, Lane didn't even know about her dress or what it would finally look like, etc.) but at least I got to GG gab! Anyway, I got these images from http://opposites-are-polar.net/index.html, where it says they are public domain. Going through the screencaps also reminds me of when I was looking for a photographer and the documentary style that I prefer. Maybe I can specifically point out to our photographer that this is how I want the day captured. 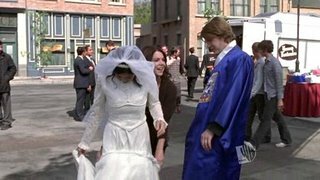 In the future, perhaps when I am bored, I can recap the older GG episodes that have weddings. Who knows, there may be some good ideas to glean or at least pretty pictures to ooh and aah over. I also love "GG" and they definitely do their research. The painted red circles on Lane's cheeks go with the Hanbok outfit - it is tradition and if you search for other traditional Korean brides online, you will see this. The tea ceremony is not really a Korean thing, but a Chinese tradition that is occasionally tied to Buddhism, and the Koreans and Chinese are linked in history anyway, so... grab a lil from here, grab a lil from there... the Japanese also have a tea ceremony. The orders may differ a little bit. For the Chinese it is an opportunity to offer your respects to your parents and ancestors, etc. thanks for the recap. the three dots on the face (one on forehead, one eachcheek) is part of the traditional korean makeup. i think the tea drinking is too, but i thought koreans sit down for that. korean hanboks can have balloon-y like pants underneath. 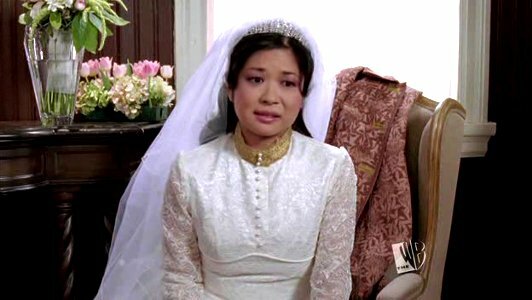 and the mom's dress does look like it was fashioned after a korean hanbok. sorry, i'm not korean but i do know some of the traditions since i have korean friends. The Korean makeup and tea ceremony are all traditional and pretty much accurate depictions.